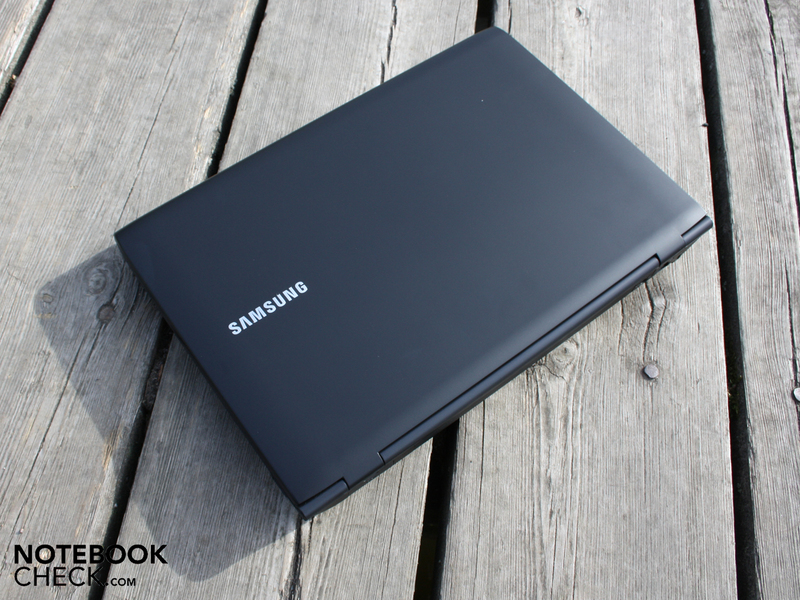 Samsung generally has a small number of business notebooks on the market. To say that they bring out four models a year (plus some variants with different specs) is perhaps already an overestimation. So is their offering small but perfectly formed? Samsung's business laptops are regarded in professional circles as aesthetically and technically straightforward, particularly quiet machines. 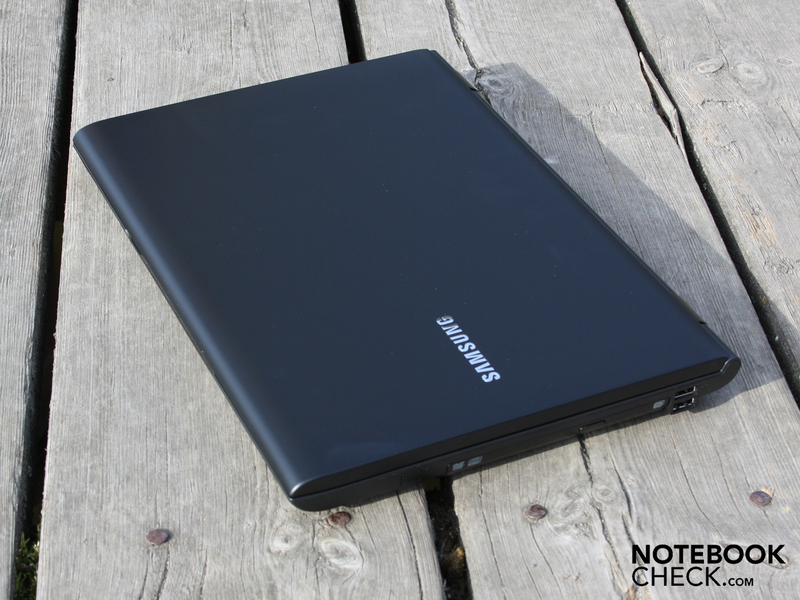 Samsung usually uses the same case for its business notebooks as for its consumer range. The system is simple - an R580 becomes a P580; the R525 becomes a P530. This is not a disadvantage for the business machines, as they get an excellent cooling system and a serviceable base unit. 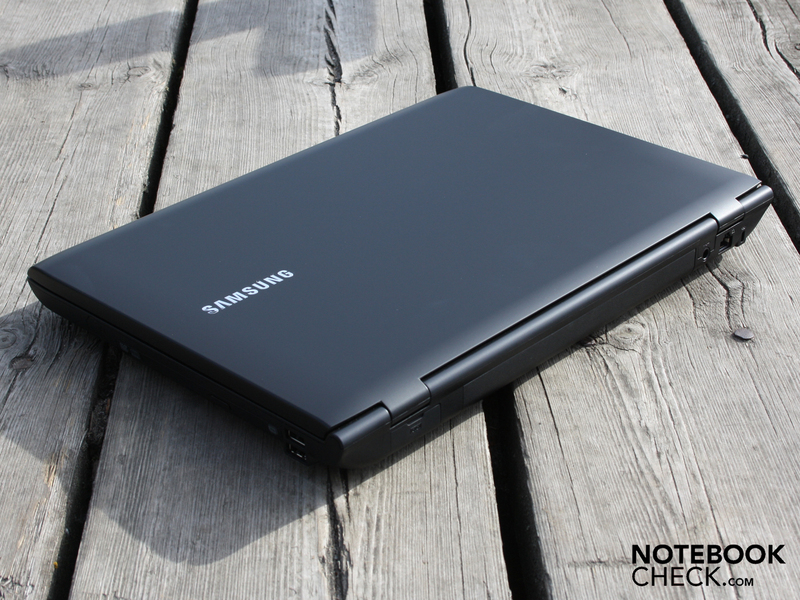 We take a detailed look at Samsung's business hot-shot, the P580 Penfield. Samsung has stuck to the basics: Core i5-430M processor, no dedicated graphics card, a matt display, easy-to-use input devices and a docking port. 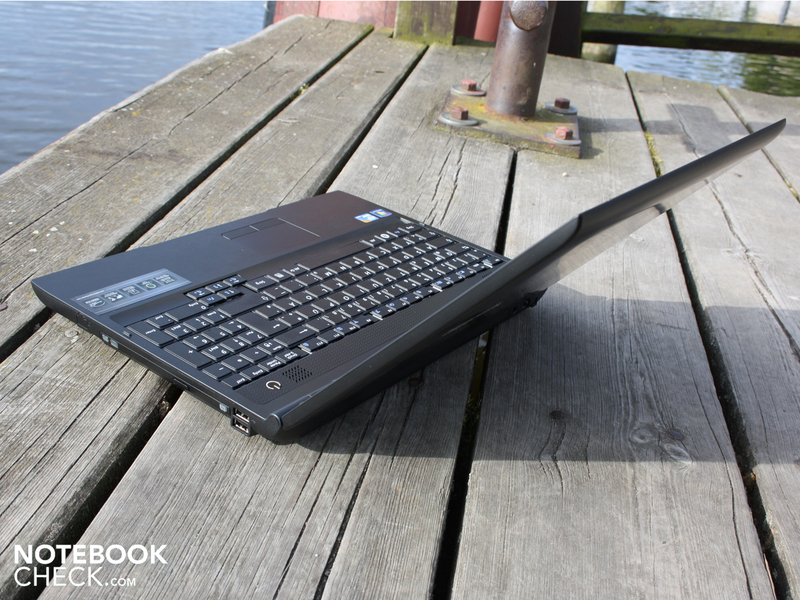 For over €800, is this notebook a convincing prospect for mobile office use? Answers can be found in our comprehensive review. 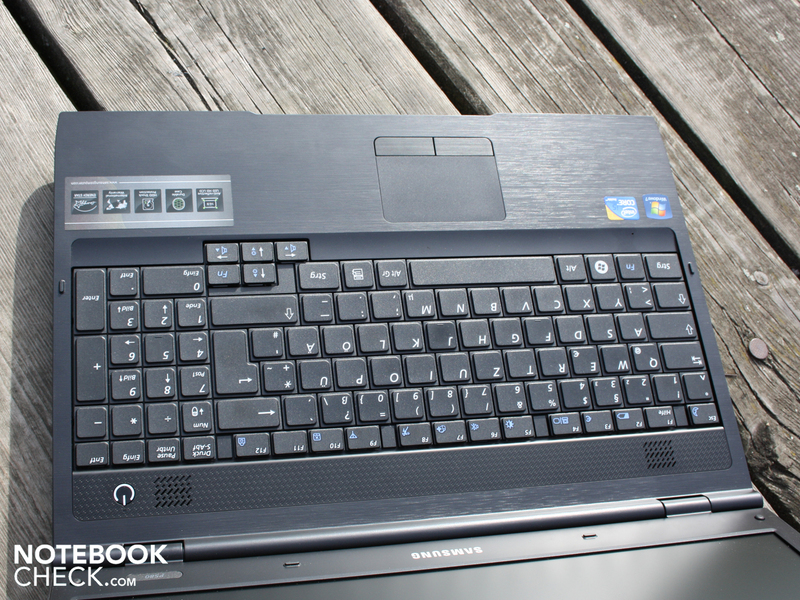 If any laptop can be said to have a sober and restrained appearance, the P580 can. Its entirely black surfaces, with only the Samsung logo and power button being marked out in white, ensure that you will not draw attention to yourself on the train. 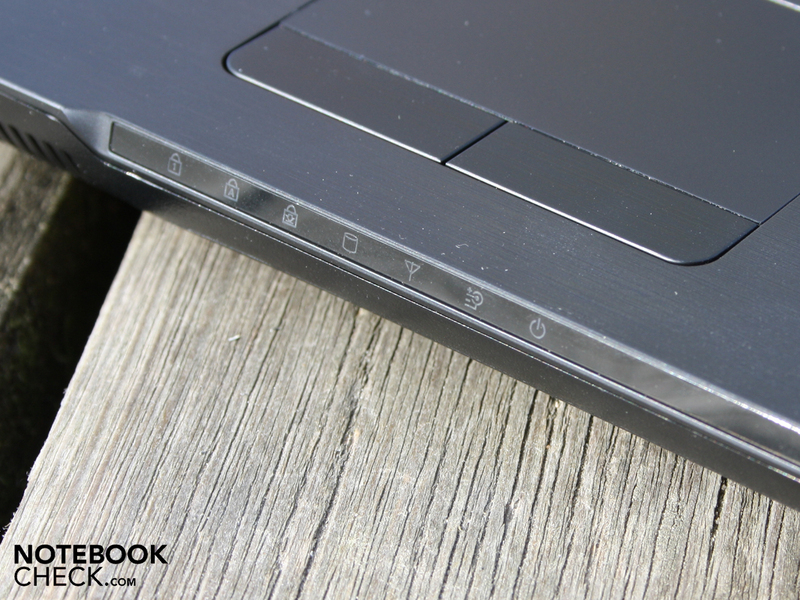 And yet the laptop has a high-quality look, with Samsung having opted for some non-slip matt surfaces. 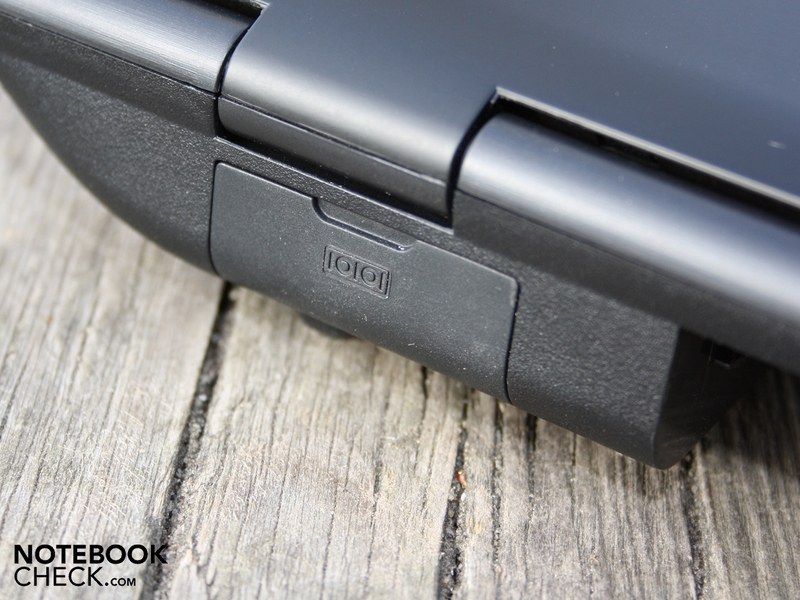 The lid has a slightly rubberized ('soft-grip') finish, which although non-slip still feels quite smooth. The main surface of the base unit, including the palm rest area, looks like brushed aluminium but feels like plastic roughened by a series of fine grooves. The base unit is robust, particularly when approached from above. The palm area and keyboard cannot be made to flex at any point. However, the base plate was slightly more vulnerable; we could make it flex in the area above the DVD drive, and around the vents. This means the case gets good but not top marks for robustness. The lid is held tightly in place by two plastic-coated hinges. You only need one hand to open it. A recess on the front edge of the machine makes in easier to grip the lid. We could only make the lid flex in places by applying strong localized pressure; it did not flex when we applied pressure more evenly. The screen is relatively thick and the frame around it is wide, which is good for stability. The P580 loses out in this area to business laptops by HP (EliteBook, ProBook) or Dell (Latitude). Whereas those notebooks carry an extensive array of the usual ports (HDMI, VGA, ExpressCard, etc) and the more unusual ones (i.LINK, modem, smart card, USB 3.0), the range on the P580 is more limited. Left: Next to an HDMI and a VGA for connecting to external monitors or TV screens, there is an eSATA port (combined with USB). 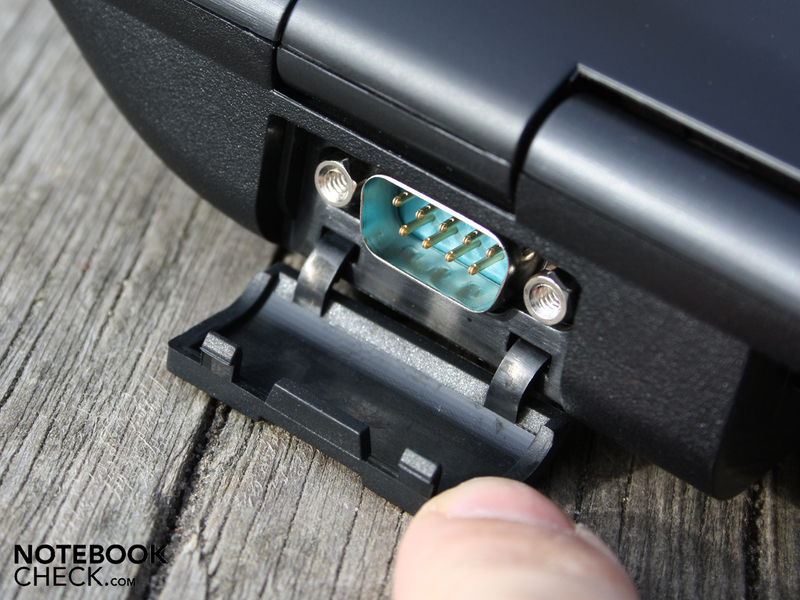 This port comes into play when fast external hard drives are used. The opening for the port has been cut somewhat uncleanly, but it works just fine. 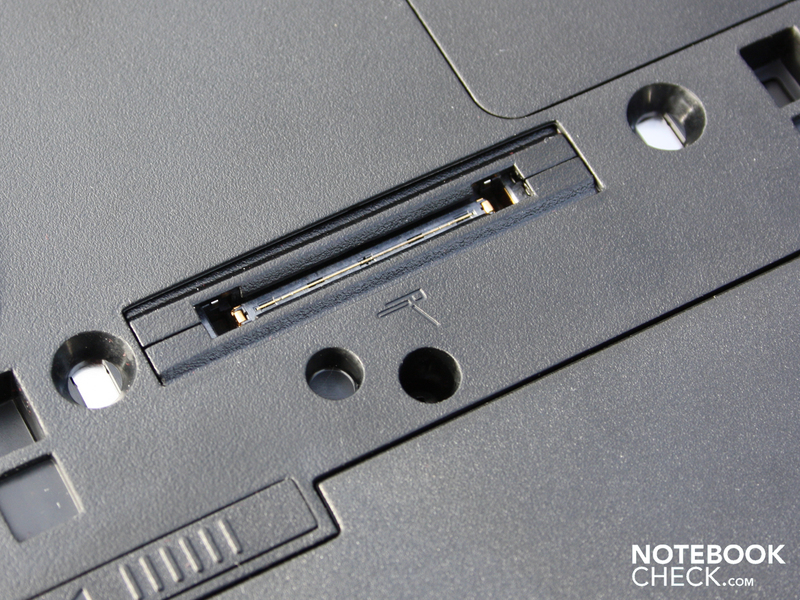 There is one USB 2.0 port here on the left side, while the other two are positioned on the right-hand side of the notebook. 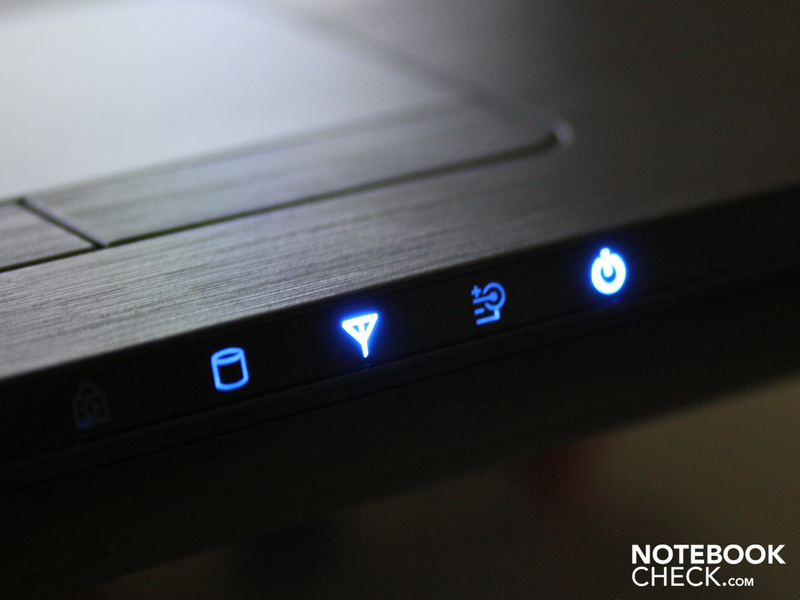 All the USB 2.0 ports can be used to recharge smartphones or similar devices (even when the notebook is switched off). So this helps to reduce the number of adaptors that you have to carry around with you. Right: Beside the optical drive you can see the blocked-up recess for a modem connection. Samsung probably decided against it for our model on short notice. 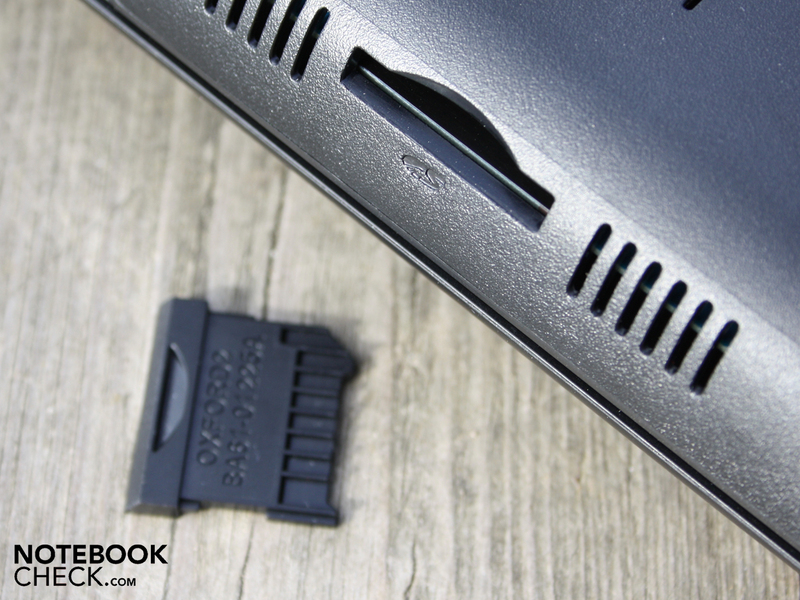 Back: Having ports on the back edge is useful for keeping your desk clear of cables. Unfortunately there are only three back here: the ethernet port (network connection), mains power socket and a serial port. This serial port, complete with screws (Com Port, RS232, nine-pin) can be seen as rather outdated these days. It used to be how you would connect certain input devices like the mouse or a joystick. But professional users may still use the RS232 for data acquisition from some machines. In short, provided you know exactly what ports you need, you can decide for yourself whether the P580's connectivity is sufficient for your uses or not up to scratch. The RS232 may be of interest to engineers, or students of mechanical engineering, for example. Those who find that the ports are not organised to their liking or who are irritated by having to plug and unplug things, can buy the Samsung P-Dock docking station for around €200. 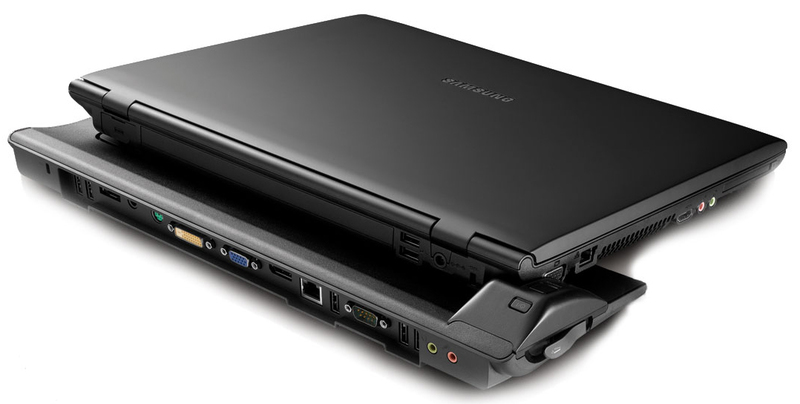 You sit the notebook on top of this, connecting via the base plate, and straight away almost all of the same ports are available through the docking station, with the addition of PS/2 and DVI: microphone, headphones, five USBs, eSATA, serial port, PS/2 port, VGA, DVI, HDMI, and LAN. 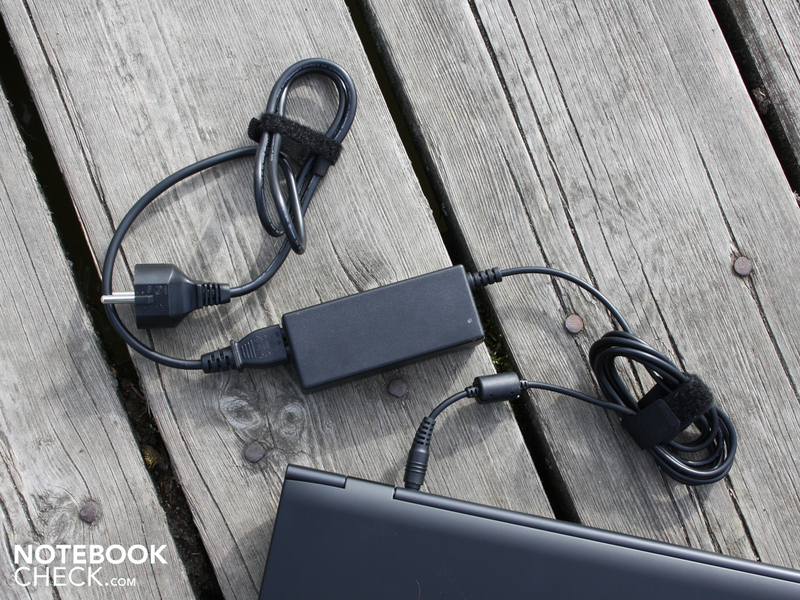 The docking station also has its own power supply, which supplies the notebook when there is a connection between them. 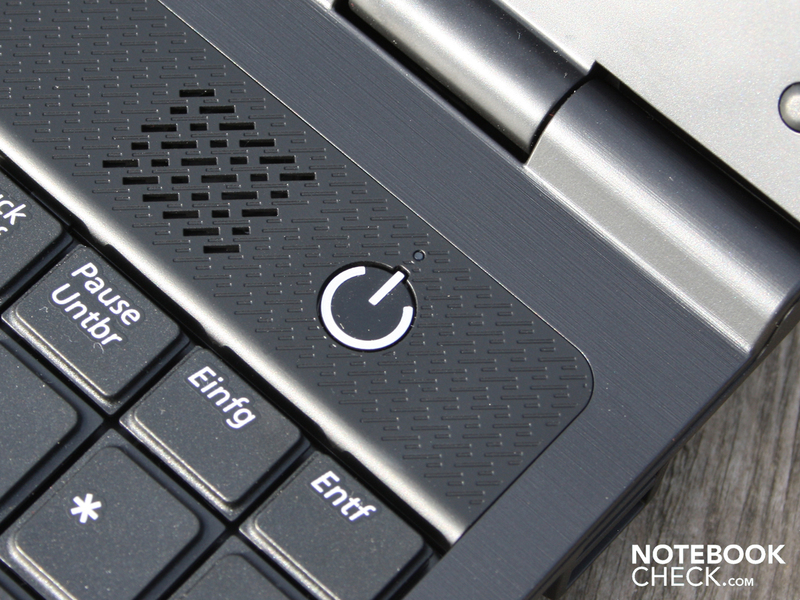 Business users may be able to do without the odd port, but a good keyboard is essential. 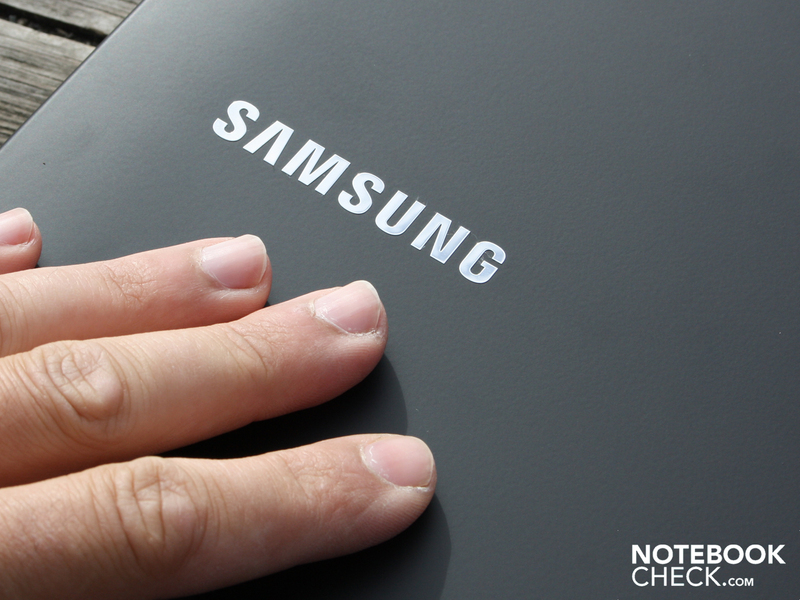 Samsung has made some good choices in this area, in our opinion; the keyboard types extremely well. The surface of the keys is firm and so is their impact point. They move smoothly and easily. The layout is roomy despite the inclusion of a separate number pad. People who require visual cues because they can't touch type will still find their fingers flying over the smooth keys; the white lettering is very clear and the arrow keys are separated off using some blank space. The keys give feedback which is firm but not excessive. They make a quiet clicking noise when pressed. 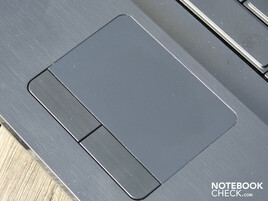 The palm rest area is rough-textured, which helps during typing; the hands are held in place and don't slip down to the hard front edge of the notebook. So the keyboard is convincing, but what about the touchpad? It sits almost at the same level as the palm rest area. It is pleasant to use, despite its small size; the surface is not slippy. It is a multi-touch pad which supports such gestures as scrolling or zooming with two fingers. Those not comfortable with multi-touch gestures can simply use the vertical and horizontal scroll bar areas, although these are not marked. 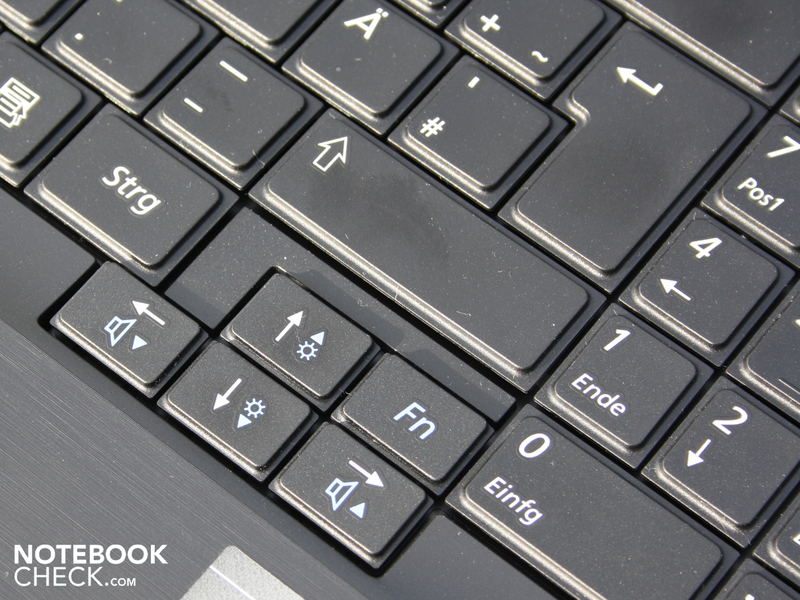 The touchpad keys have a roughened texture and click very easily and quietly. 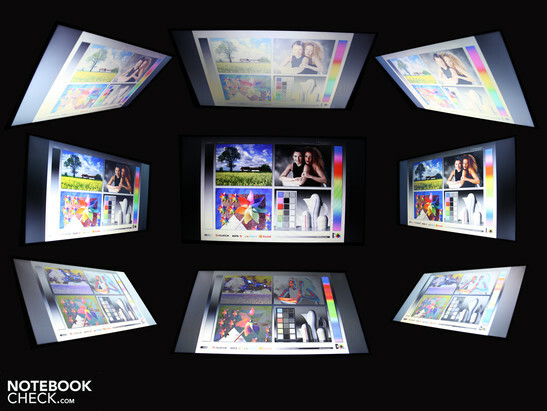 The P580 Pro's HD-ready screen has a native resolution of 1,366 x 768. The display (a Samsung LTN154X3-L01) has a matt finish, almost completely eliminating reflections from direct light sources. It looks like Samsung has used the same model of display as it did on the more powerful consumer model, the R580 Hero, except that the R580 display is glossy (no anti-reflection coating). The contrast ratio of 109:1 is especially weak and not suitable for reproducing vibrant colours. But this is not a requirement for this type of laptop. However, the poor contrast does suggest a very small colour gamut; a suspicion which was confirmed when we measured the ICC profile. The 15.6-inch screen's LED backlighting gives it an average brightness of 176 cd/m². This is enough for indoor use, but not for direct sunlight. 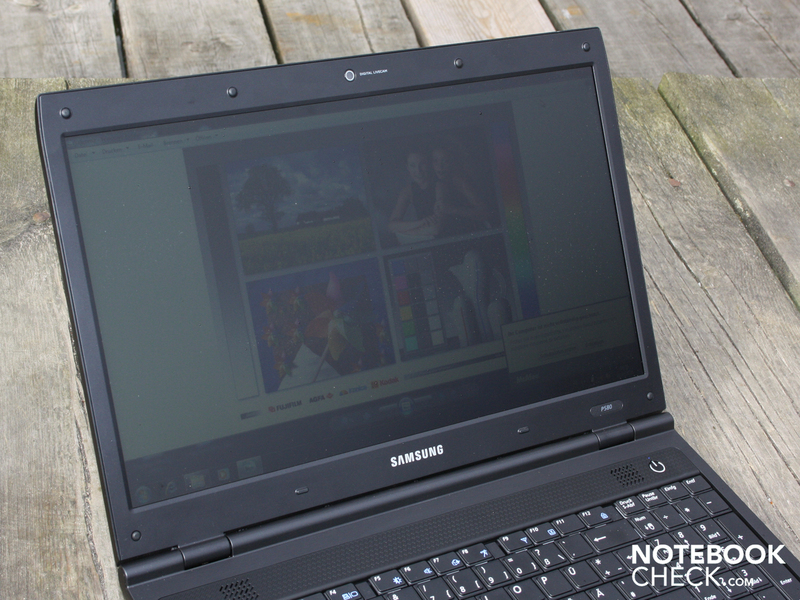 So even with its matt surface, the Samsung screen is not ideal for outdoor use. The brightness is too low for that (176 cd/m²). The picture to the left was taken during cloudy weather, but already you can see the screen is too dark. Text, buttons and fine contours are hard to make out. The result is even worse when you look at the screen from the side. If you want to sit outside watching a football game with the P580, you'll need shade, or better still, dusk. An office laptop should have a good range of viewing angles, so that observers standing to one side or looking at the screen from an elevated position can still make out colours and text with a consistent brightness. 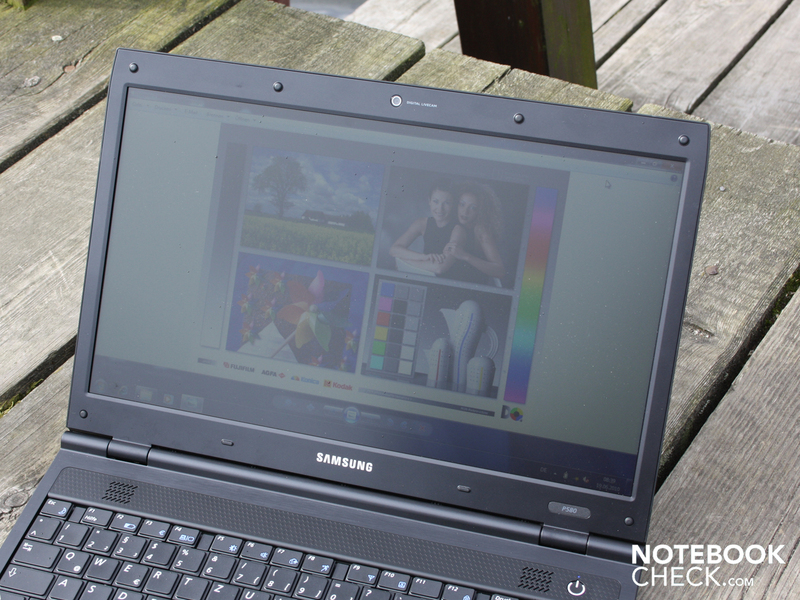 In this area the matt Samsung screen (LTN154X3-L01) is only average, at about the level you would expect from a consumer notebook. 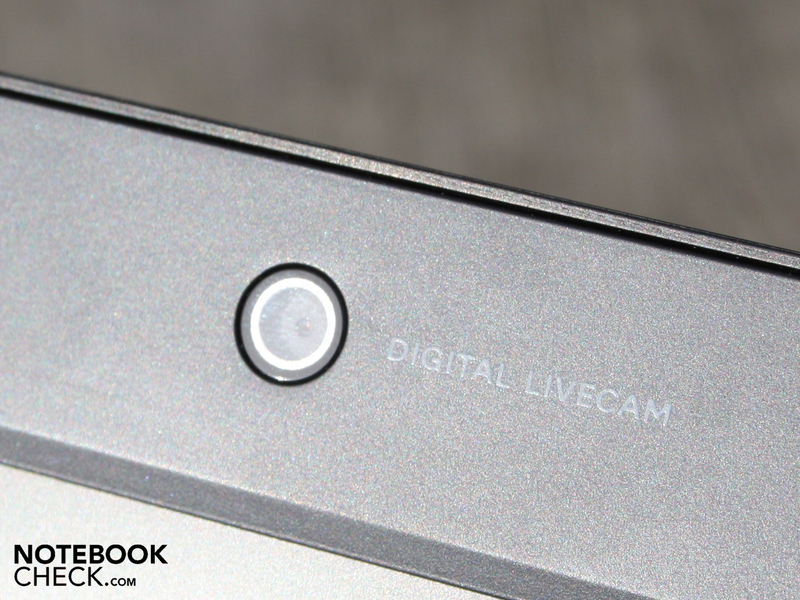 The vertical and horizontal viewing angles are equally average, that is to say, limited. Horizontally the eye can deviate by up to 45° before the screen darkens, while colours start to invert at around 60°. Vertically, the effect starts at a 20° deviation from the ideal face-on position. 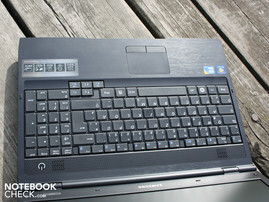 Samsung has equipped its P580 with an Intel Core i5-430M. The processor has two cores, each with 2.26 GHz (nominal speed). The real speed can in practice go as high as 2.53 GHz using the Intel turbo-boost feature. The speed is determined by what application is being used, with the CPU automatically governing the dynamic overclocking. Another feature of the processor, hyper-threading, is of particular use for multi-core applications. This function allows the two physical cores to be joined by two additional, virtual, cores. This means applications can have the use of up to four cores. Also included is 4,096 MB of DDR3 RAM. All Core i5 processors have an integrated memory controller and integrated graphics card. In the absence of a dedicated graphics card or a graphics core in the chipset, Intel's HD Graphics provides an energy-saving video solution, which can also connect through VGA or HDMI. The GPU does not have its own video memory, but helps itself from the generous amount of DDR3 memory available (4,096 MB). The graphics performance is better than the old GMA 4500MHD (integrated into the chipset). With overclocking of up to 766 MHz using turbo-boost, the performance is at times almost as good as the Nvidia 9400M/ION chipsets. However, gaming performance is virtually non-existent. The Intel HD tends extremely well to hardware acceleration when decoding HD video. This takes a lot of pressure off the processing core when watching 1080p videos (H.264), for example with Windows Media Player under Windows 7. The PCMark Vantage test assesses the overall performance of the system, examining the interplay of CPU, GPU, RAM and hard drive. 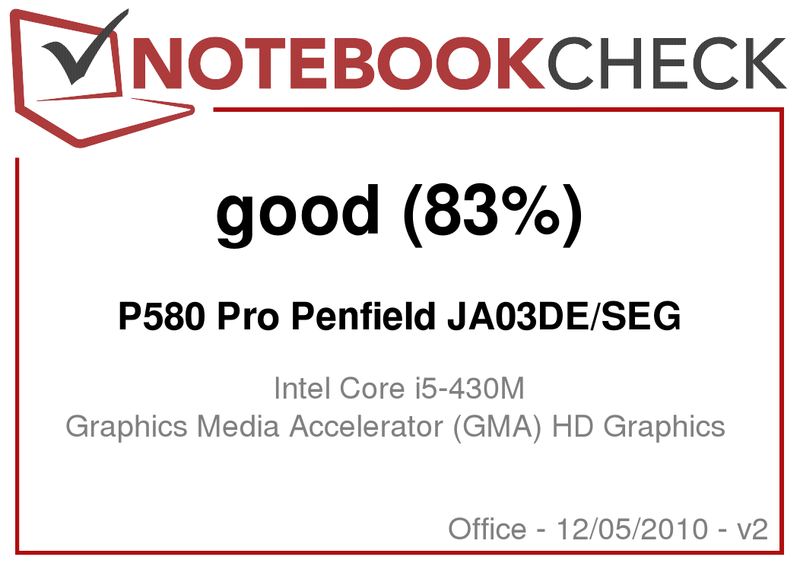 Its total score of 4,372 points was surprisingly poor, lying significantly below other similar laptops with the same CPU. A Toshiba Tecra A11-125, for example, achieved a very good 5,676 points; the Dell Vostro 3500 with its weak dedicated GeForce 310M still achieved 5,340 points. However, there are systems with an identical CPU and GPU like the Asus N61JV which delivered an almost identical score (4,239). 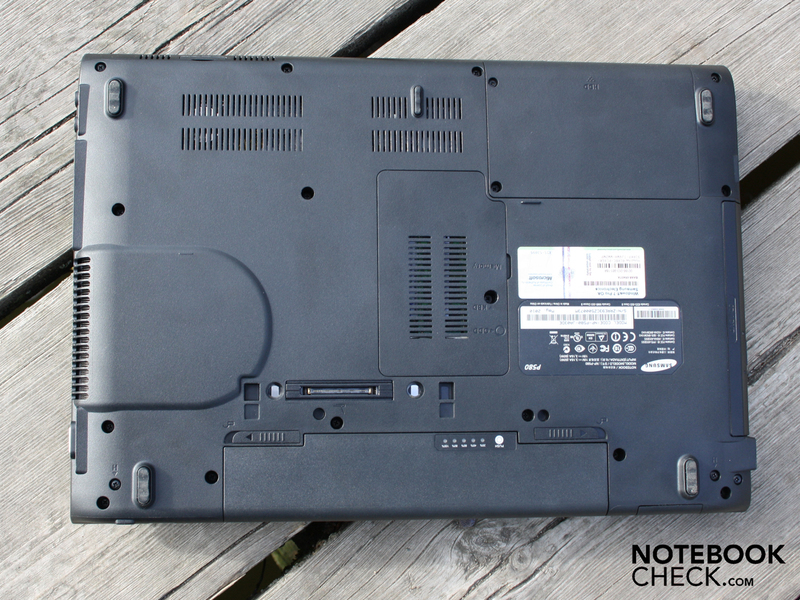 Our review model is more on the level of a Core i3-330M laptop like the Lenovo Thinkpad L512 (Intel HD) with 4,684 points. Our search for the cause of this unusually poor result from the Core i5-430M system started at the hard drive. But this is faster than average for its class, with a speed of 72.5 MB/s (sequential read), as is confirmed by the good HDD subscore of the PCMark Vantage test (3,102 points). Possible cause number two would be the lacking graphics performance. The gaming subscore is really very low at 2,899 points. 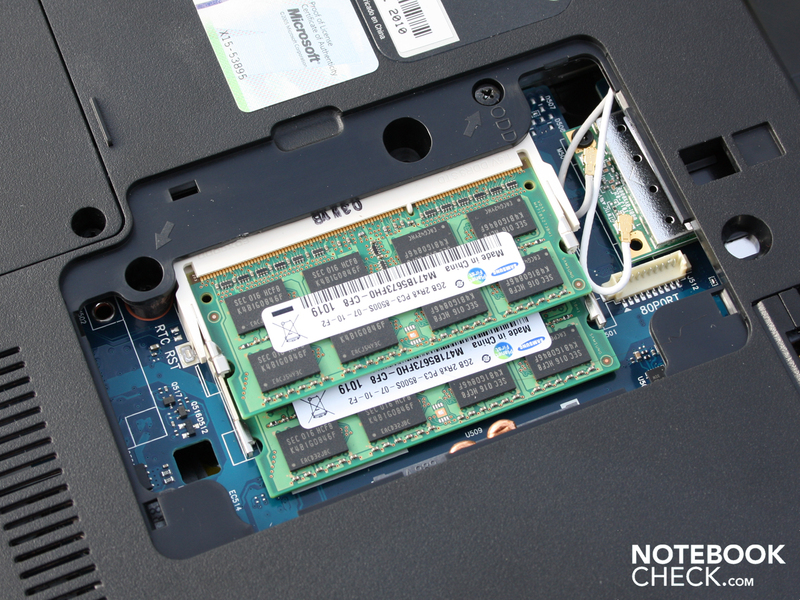 To compare: an ATI HD5650 system can achieve 4,319 points (in the Acer Aspire 8942G-334G64Mn). The other subscores, like productivity or music, are low but not noticeably worse than the typical values for an i5-430M system. 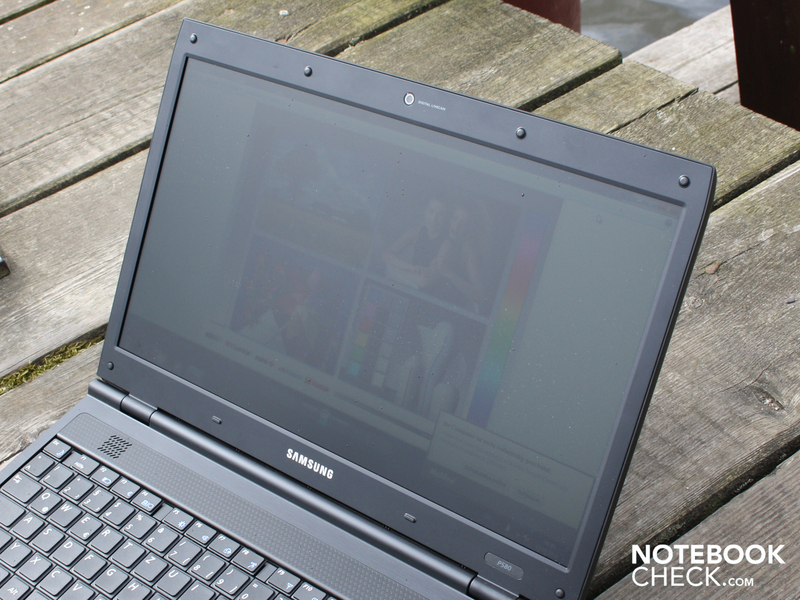 The TV and movies score (3,859) is likewise similar to other notebooks with similar hardware. However, what does slightly drag down the performance is the 32-Bit Windows 7 Professional operating system that has been used. Despite the seemingly low PCMark Vantage results, potential buyers really should not be concerned about getting a lame duck. On the contrary, working on the notebook feels fast, and running installations and programs simultaneously does not lead to long response times. The 4GB of DDR3 RAM does its bit to help here. 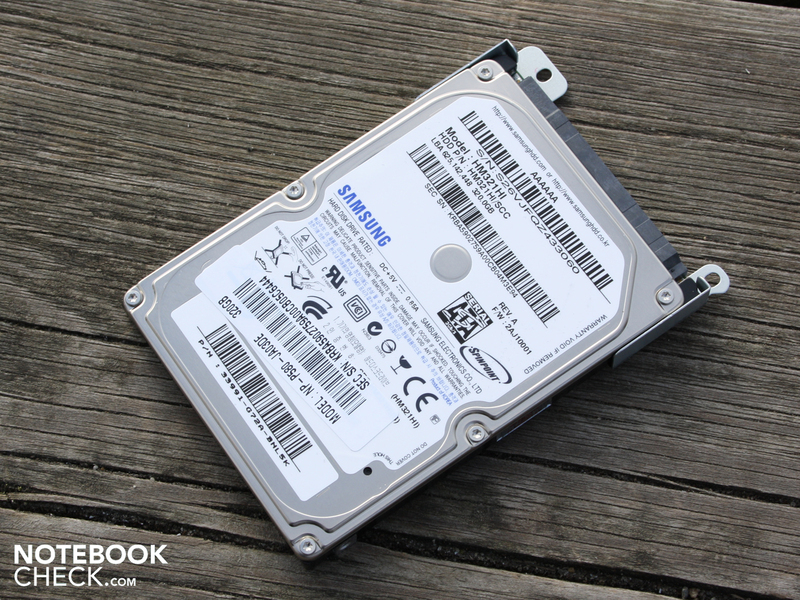 The hard drive (model type Samsung HM321HI) has a 320 GB capacity and a speed of 5,400 rpm, which is standard. HD Tune measures an above-average speed of 72.5 MB/s in sequential reading. 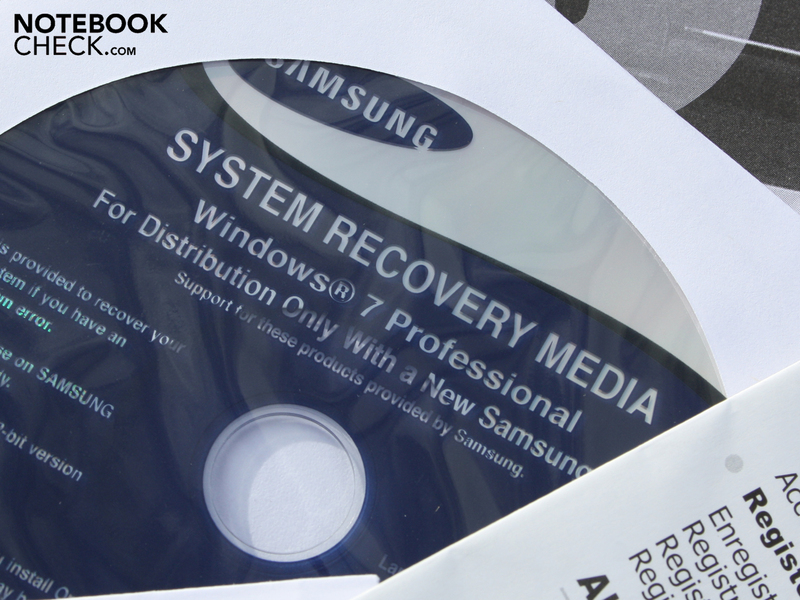 The average burst rate of 84.5 MB/s could make the hard drive slower under some circumstances. A high burst rate would be around 110 MB/s. Burst rate is a indication of the rate at which data can be transferred from the hard drive cache. But a few megabytes here or there does not make much difference. It is more important to know your data is protected, for example through the P580's fall sensor. 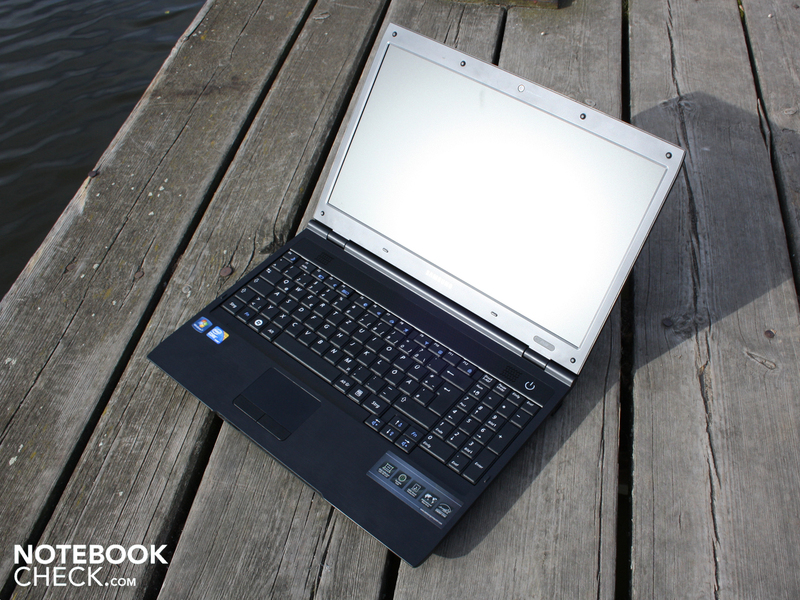 If the notebook senses a fall it orders the hard drive to stop working; the read heads are parked and so cannot damage the surface of the rotating memory storage upon impact. 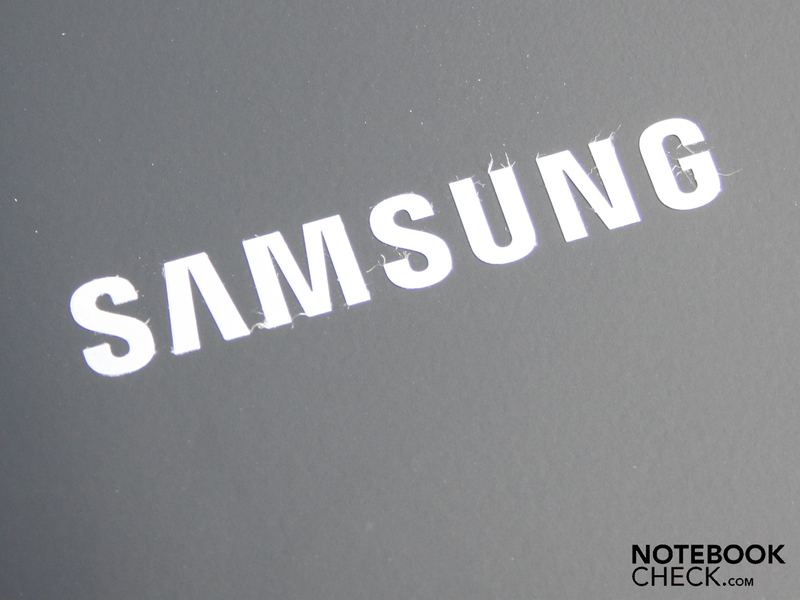 According to Samsung, the sensor can withstand the shock from a weight of 300g, and 900g if the hard drive is not currently active. The response from the keyboard can be delayed for a short while if the fall sensor is active. And as with all fall sensors, there is the problem that it only activates after a certain depth of fall - generally 60cm. This distance is necessary for the sensor to notice that the laptop is falling freely. The low system noise of the Samsung P580 Penfield is one of its best points. While surfing, writing emails or compiling lists in Excel, the fan does not run at all for long periods of time (29.6 dB(A)). If the fan does come on during temporary increases in workload (32.8 dB(A)), it turns itself off again as soon as the activity is finished. For the fan to act this way, you don't even have to have activated silent mode (using a Fn combo). When you do use it, it sets the energy profile to 'energy-saving mode' and forces the fan to spin much more slowly (during heavy use) or to turn off completely (light workload, idle). This may sound like the perfect solution. But this peace is bought with a drop in performance; silent mode restricts the processor speed to 1.2 GHz. This is the same speed that the processor runs at in energy-saving mode. During normal use with the turbo-boost function in play, speeds of 2.26 to 2.53 GHz are possible. There is also a 'speed mode' (activated using an Fn combo) but we did not see it have any effect on the processor performance during the CPU benchmarks (compared to normal mode). Neither the speed of the fan nor the speed of the processor increased in speed mode. 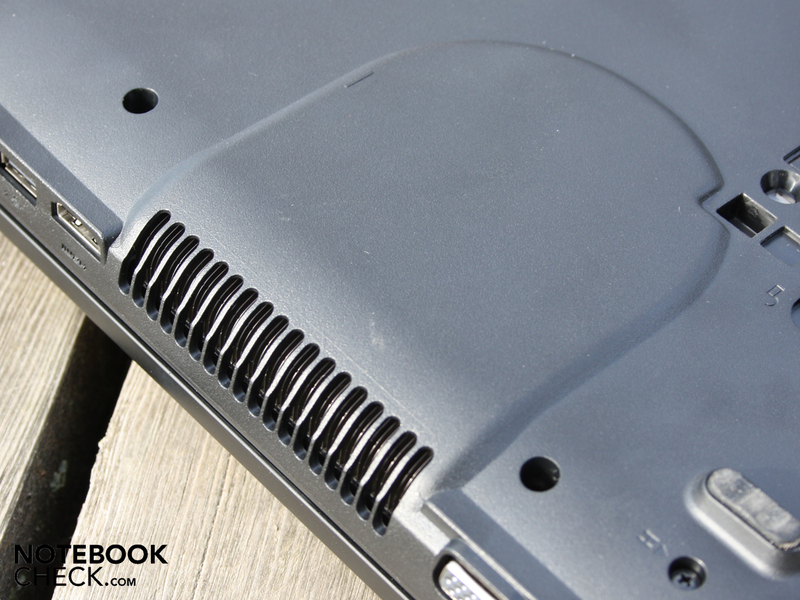 The increase in temperature on the top side of the laptop can be classed as insignificant. 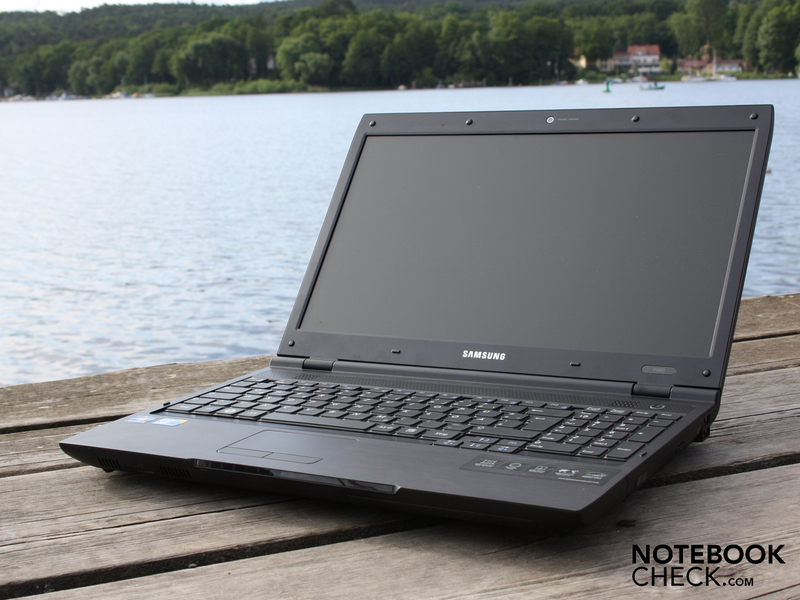 In an office situation where there are alternating periods of light and heavy use, the Samsung P580 remained cool. 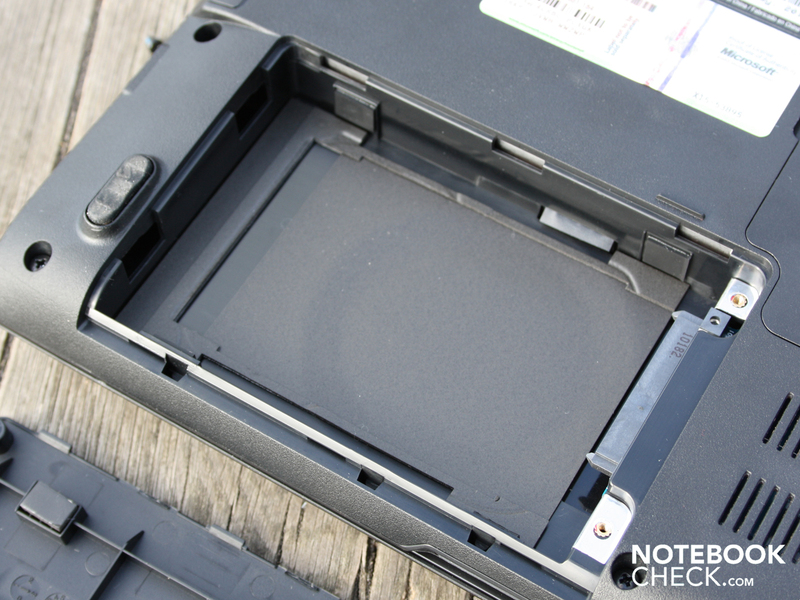 The number pad only reached 24°C in idle, while the warmest point on the underside of the notebook was only 31.8°C. Silent mode was enabled during these measurements. If you are only going to subject the P580 to light to moderate use, you can expect temperature increases of only about 3°C. After a processor stress test the temperature of the palm rest area did not exceed 29°C. We performed a stress test lasting several hours, to test the performance of the cooling system under extreme conditions; the Samsung P580 Pro Penfield came through with flying colours, being only slightly warmer than it was in idle. The maximum reading we took on the top side of the base unit was 31°C under heavy use. After the stress test we also measured 37.6°C in the area of the heatpipe. Working with the notebook on your lap is still very much possible at this temperature. The core temperature of the processor did not rise beyond 74°C, which is another sign of a well-proportioned cooling system. The stereo speakers are located above the keyboard, under some very small openings. There is no subwoofer and the sound places so much emphasis on the higher frequencies that it almost hurts your ears. Middle and lower frequencies are neglected. The volume is sufficient given the overall size of the notebook. We recommend activating the SRS sound enhancements, as this alleviates the high-frequency problem a little. Connecting up external speakers solves the problem entirely. We tested the quality of the sound output, and found it to be free from sound disturbances and to have a strong output volume. 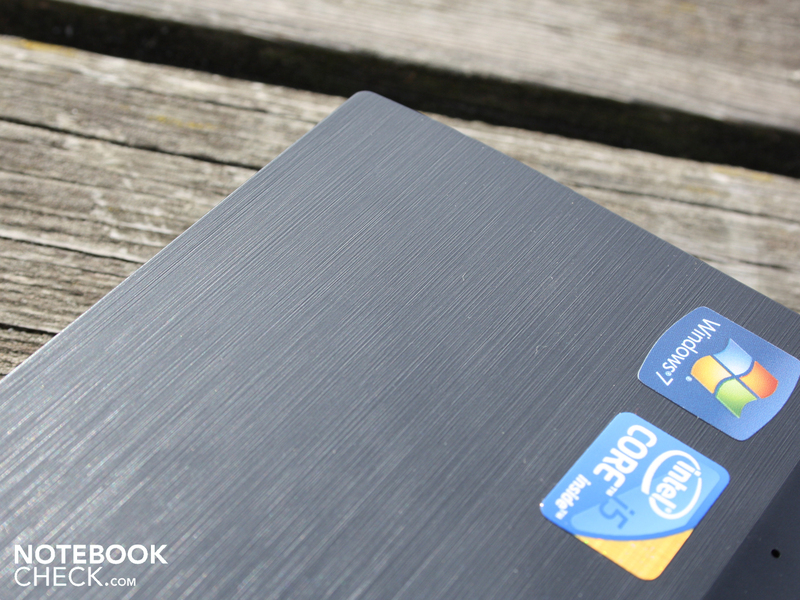 How is a business notebook like the P580 Pro going to be used? The ergonomic features, non-slip surfaces and matt display suggest that the designers had travel in mind. 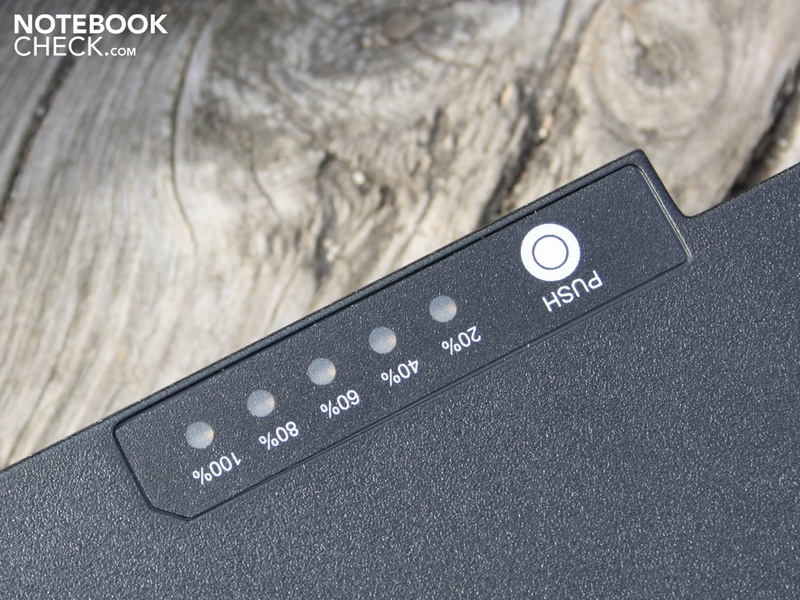 But in this respect, the notebook is going to disappoint its buyers with its very short battery life. Every test we ran used silent mode, other than the minimum battery life test. The battery life for a wireless internet surfing session was 2 hours 24 minutes (144 minutes), during which time we viewed news sites and left open websites with Flash animation. If you are very frugal, only scrolling through word documents and typing a little, with the maximum energy-saving options enabled, you can make the battery last for five and a half hours (337 minutes). That is the maximum battery life as determined by the Battery Eater Reader's test (light use, no WLAN). 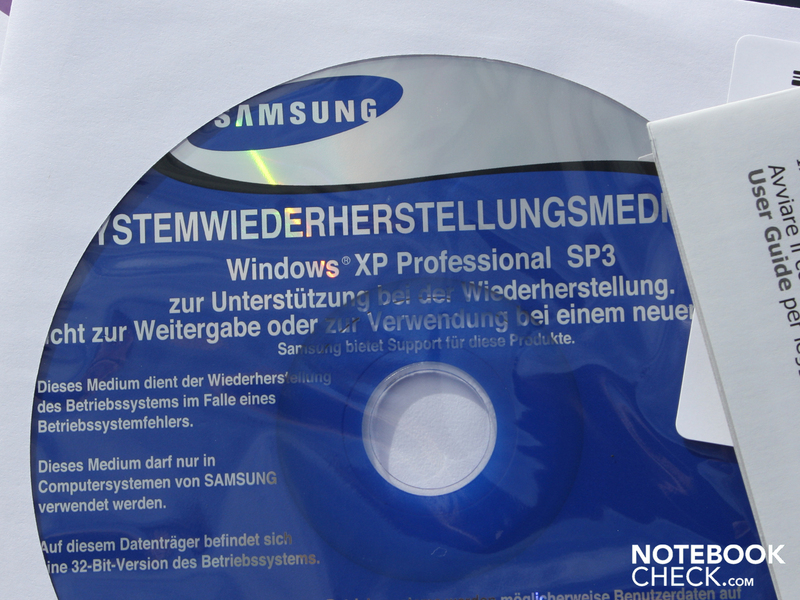 The DVD test ended after 158 minutes (two hours and 38 minutes). The 5,200 mAh battery is ready for the next session after recuperating for 2 hours and 15 - this is how long it takes the battery to recharge from start to finish. In a test of our own, we measured the battery run time during real life use. On a trip to and from Munich by plane and train we did not use wireless or a 3G mobile internet stick. 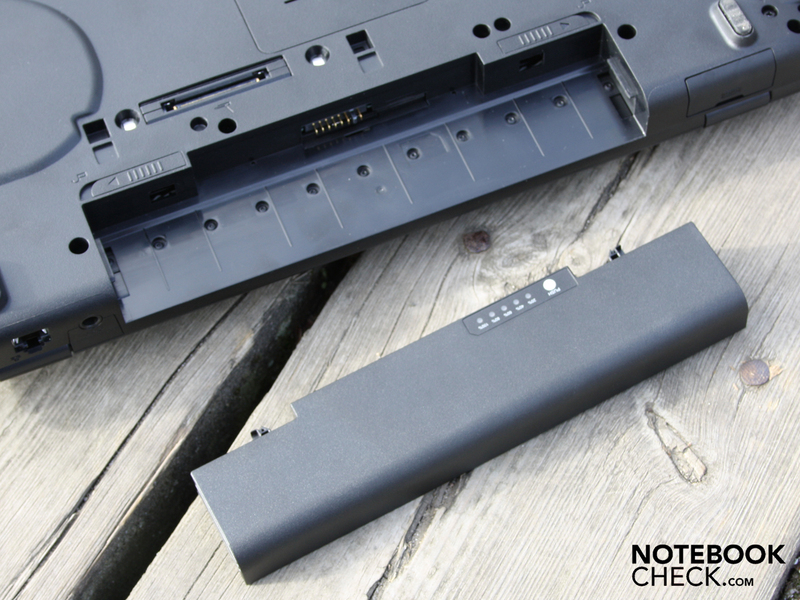 The 5,200 mAh battery lasted 3 hours and 15 minutes, after which we were still able to put the notebook on standby. On another day, when using the internet stick (UMTS), the same battery gave out after two and a half hours. So the P580 Pro Penfield is really only portable in a limited sense of the word. The size of 15.6 inches also proved to be rather bulky and unwieldy on the plane and at the press conference that followed. Heavy use test 115 min. The battery run times in the various operating modes, which are at most acceptable for a 15.6-inch machine, were accompanied by low energy consumption. We saw a minimum consumption of 10.1 Watts by the i5-430M system (idle, maximum energy-saving measures, silent mode). However, the more realistic light use scenario, with WLAN activated and the top brightness setting, gave a reading of 21.8 Watts (normal mode). Those people concerned with saving energy should definitely keep silent mode on continuously. During the various light use scenarios, this reduces the energy consumption by up to 6 Watts. This is because the mode limits the CPU speed to 1.2 GHz (with turbo-boost deactivated). If the Core i5-430M is processing with all its might (and the graphics core too), the power consumption is 67.5 Watts. But such a high energy usage is not going to be reached during the normal run of things in the office. We only achieved this value in the stress test with Prime95 and Furmark. During the 3DMark06 test energy consumption was only 45.6 Watts. The small 60 Watt mains adaptor seems a little inadequate given this maximum consumption of 67.5 Watts. If you were to add the battery recharging to that, you would already have exceeded 100 Watts; but, this is actually prevented from happening because the battery does not charge during heavy CPU usage (determined during the stress test). Samsung's P580 Pro Penfield represents a successful blend of features for professional or private office use. From €845 (Penfield) you get a 15.6-inch machine with a matt screen, which is focused on core capabilities. A dedicated graphics card has simply been omitted, in favour of the Intel HD Graphics integrated into the processor. The processor is an Intel Core i5-430M, although it is rather dragged down by the pre-installed Windows 7 Professional 32-Bit operating system. On the other hand the 320 GB Samsung Spinpoint hard drive does not slow anybody down, and it stays extremely quiet into the bargain. 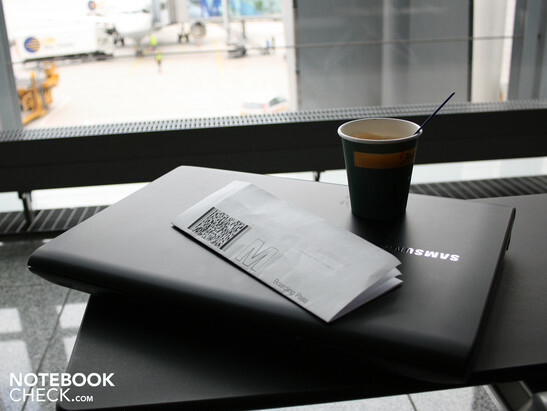 The notebook's strong points are its matt, non-slip surfaces and excellent ergonomic features. The tried and tested Samsung silent mode saves energy and keeps the fans off for long periods (office use, light workload). 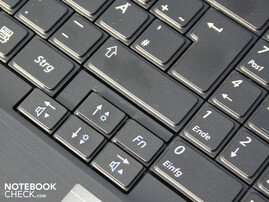 We very much liked the smooth-running and firmly mounted keyboard with its separate number pad and detached arrow keys. The tactile feedback of the keys is very good and it is easy to hit the right target. With all this praise, we don't want to forget the downsides which mean that the notebook gets no more than a 'good' in the overall rating. The battery life is not good enough, not even reaching 3 hours with WLAN or mobile internet surfing. There is also the matt display which is nevertheless not bright enough for use in sunlight outdoors. The contrast ratio is also particularly poor. 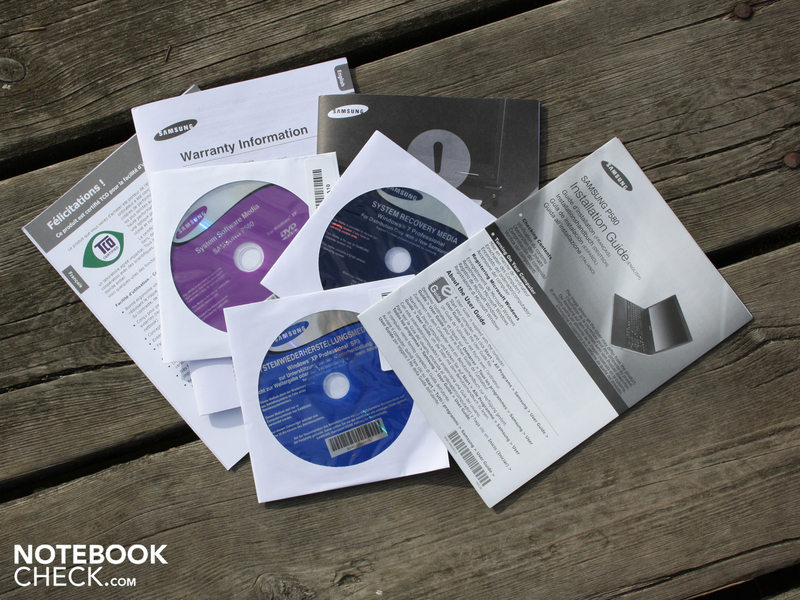 Samsung has designed a docking port for use with the whole P580 range, but comparatively speaking the connectivity only covers the basics (no ExpressCard, FireWire, 3G UMTS module, modem, or USB 3.0). 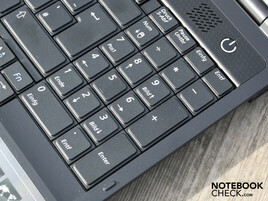 The P580 Penfield is a good fit for people looking for a solid office notebook, who are not too concerned about weighing up the cost of different hardware configurations. You can save money with the P580 Pesaro variant, which uses an i3-330M and is priced from €750. The high-end equivalent, the Pikaso, comes with an Nvidia GT330 and i5-520M but costs €1,050. Looking for a charming office companion without the extra baggage? The battery only keeps the notebook going for a short while - 2 hours 24 minutes (WLAN test). 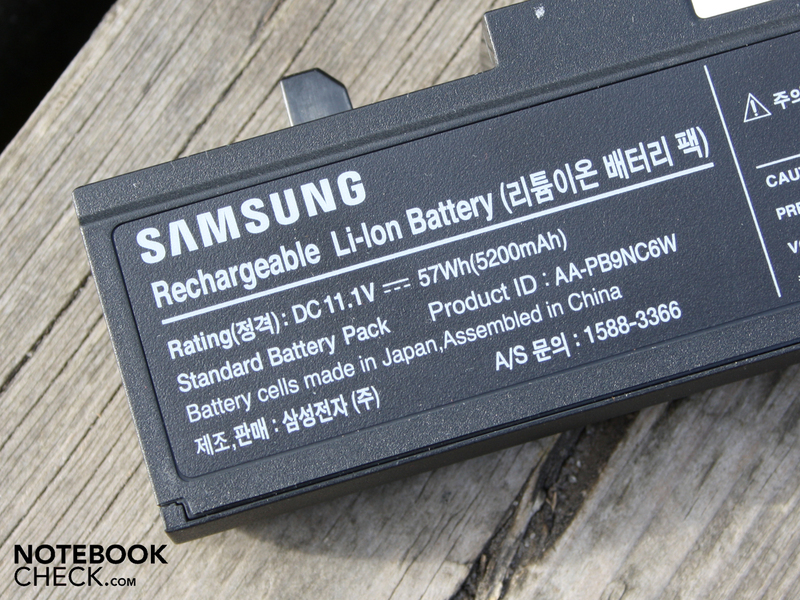 The 5,200 mAh capacity is not enough, even though the energy consumption is low. 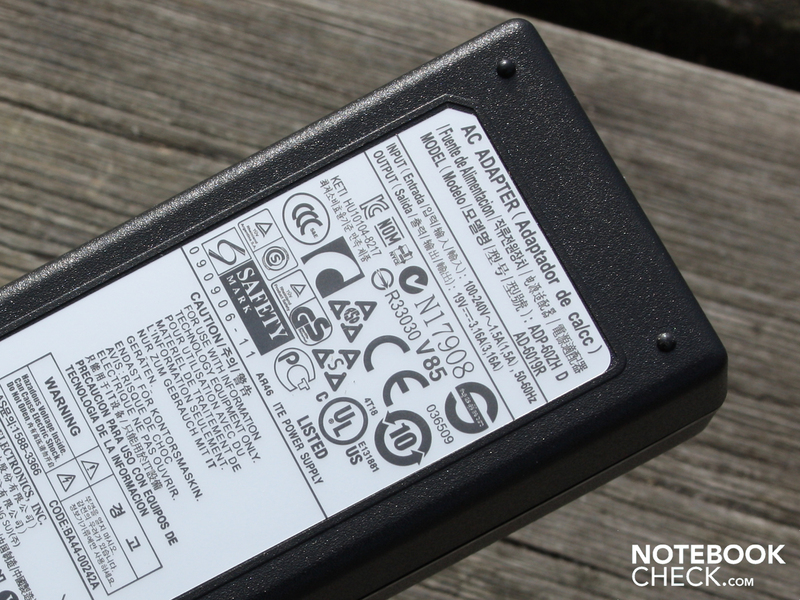 But LEDs on the battery show its recharging status. You should always travel with the small, light mains adaptor. It delivers 60 Watts of power and is plugged in at the back. 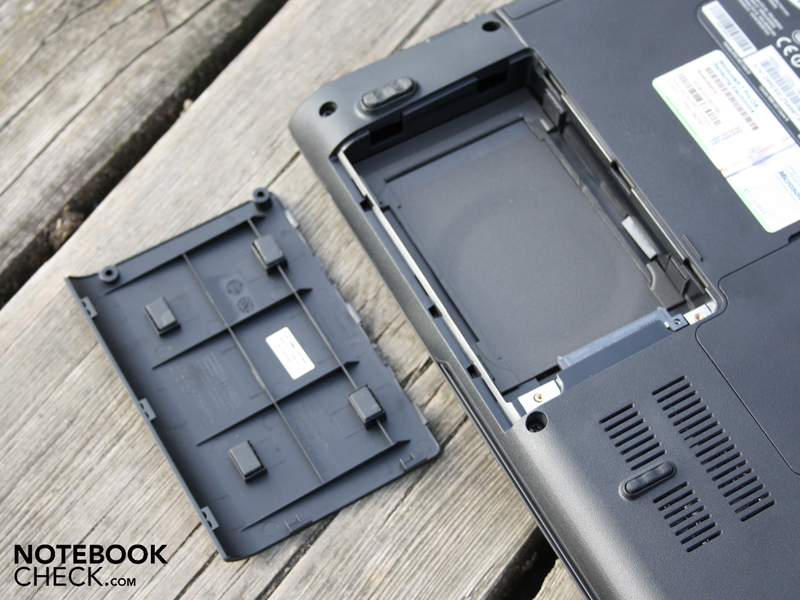 The underside of the laptop has several access panels. a Samsung HM321HI with 320 GB. The hard drive is well insulated and remains inaudible at all times. The DDR3 memory sits in two slots. The matt display is not bright enough, which is a problem in sunlight. is concealed by a rubber cover. 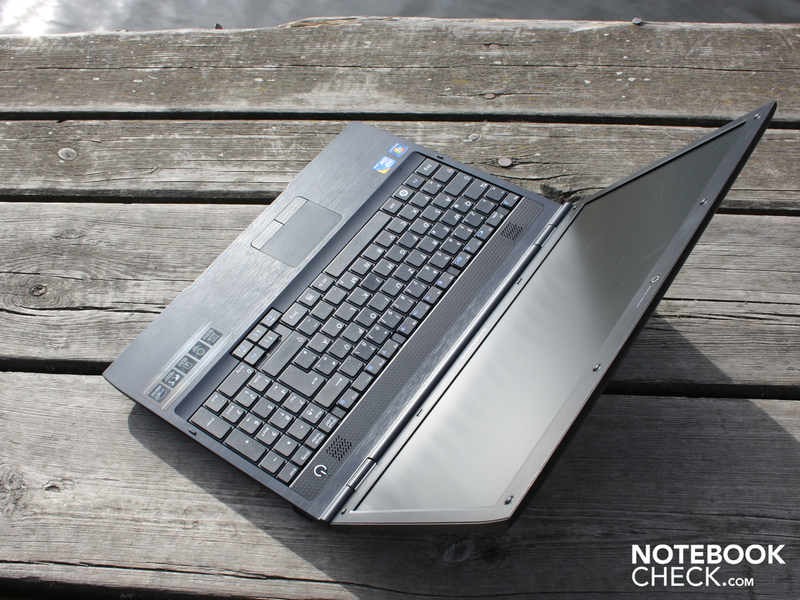 Samsung has the right 15.6-inch notebook for you. you can focus on what's important - your work. The P580 Penfield's classic black case contains an i5-430M processor but no graphics card. and thanks to silent mode, there is generally no sound to be heard (during office use). the front edge housing only an inconspicuous card reader. along with status LEDs for hard drive activity, battery, WLAN and so on. The icons light up discreetly in the dark. A very good keyboard for people who have to type a lot. A separate external keyboard is completely unnecessary. Silent mode and the low energy consumption are also fantastic. A brighter screen and longer battery life would have greatly increased portability. That a sober and slightly flawed notebook like this could still excite our enthusiasm. In the €800 to €1,000 price range of office notebooks, the HP ProBook 6540b (89% rating) stands out. 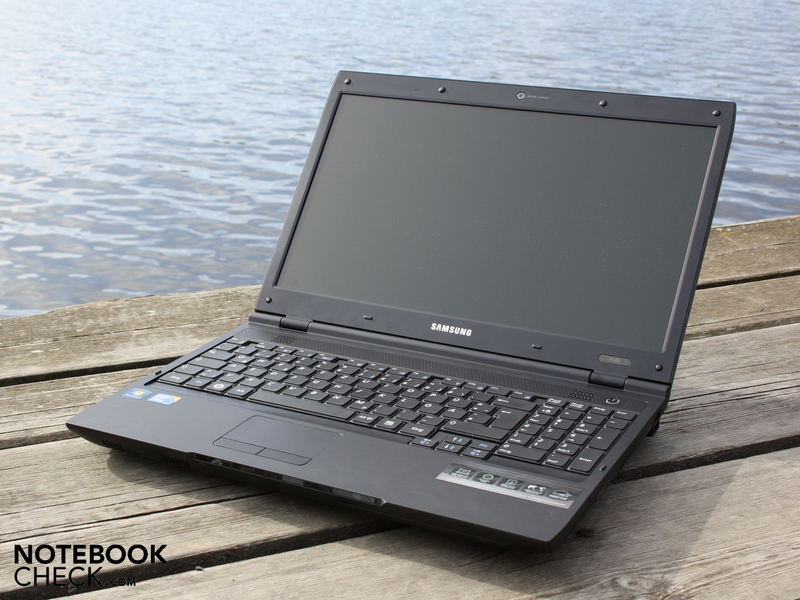 The 14-inch notebook with a 1,600 x 900 resolution is available from €880. 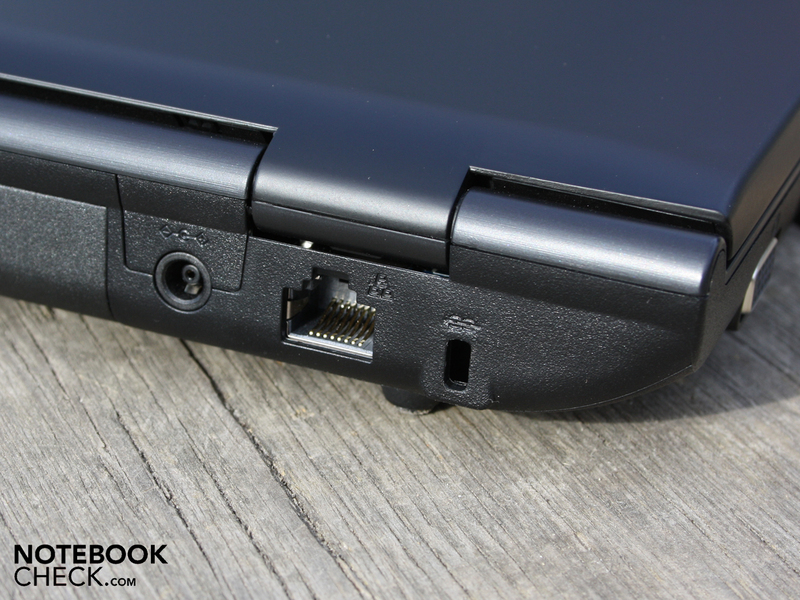 The Lenovo Thinkpad L512 2597-5VG is a similarly good office notebook with a docking port from about €800. The Lenovo Thinkpad T510 (86% rating) and Dell Latitude E6410 are in a higher league, price-wise, but are better in many respects.